One of the most frustrating things about cloth diapering can be figuring out a laundry routine that works! What works for one does not work for all and one little change can throw everything off! 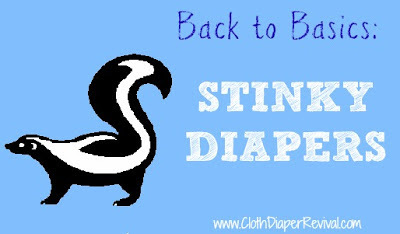 At some time, you may begin to experience stinky diapers and I don't mean because of what's in them! Below are two of the common reasons your diapers may stink. Barnyard is used to describe smelly diapers that have just been washed. When your diapers are supposed to be clean, they should smell clean. If they have a funky smell after washing, you are dealing with barnyard. Increase detergent used - If you aren't already using the recommended amount of detergent, you should increase the amount of detergent used. Switch detergents - Your detergent may not be doing a good enough job. I found this to be true when using free and clear detergents. Load size - Be sure not to overload your washer. Washing the optimal amount of diapers (18-24) in one load will ensure your diapers are getting clean. Ammonia can be quite the burden! You'll know it's ammonia because it will burn your nose and eyes. Itching nose and watery eyes are common once you smell it. However, the smell can be light or it can be really heavy, depending on how bad the ammonia problem is. There are two times you may experience ammonia. Diaper Pail: If an ammonia smell is coming from the diapers in your pail, you have a little less work to do. This is actually pretty common. To fix this, you may want to wash more often or be sure to rinse every diaper before putting it in the pail. On your baby: If you notice an ammonia smell as soon as your child pees or upon walking into your child's room in the morning you have a little more work to do. Ammonia can cause rashes that could be very painful for your baby, so it's important to treat your diapers. Too much or not enough detergent - Either increase or decrease the amount of detergent you are using. If you are using less than the recommended amount, try increasing. If you are using more than the recommended amount, try decreasing. Detergent not rinsing out of your diapers - Both hard and soft water have a hard time rinsing all of the detergent out. Try increasing the number of rinses you do. I like to leave the lid open on my top loader during the rinse cycle to be sure that all of the suds are gone during the rinse cycle. Hard water - If you have hard water, try adding Calgon to your wash routine. Before trying any of these solutions, you should strip your diapers. This will help you start with a clean slate! You should always check with the manufacturer of your diapers for washing instructions. Some of the suggestions above may void warranties.